This is a gorgeous, simple, Japanese one pot recipe which takes hardly any effort and tastes divine. I took it from a little recipe booklet I got from the Kikkoman event I went to last year and still use it often. Love it. As ever, I have adapted it to suit the contents of my fridge. 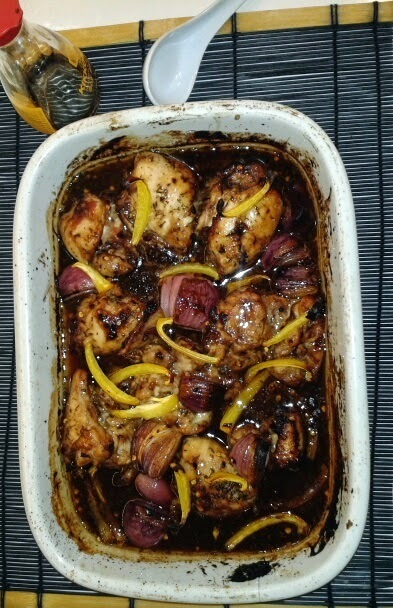 Place the chicken in a roasting dish with all the marinade ingredients and the onions. Cover and marinate in the fridge for about an hour. Bake in the oven for about 20-30 minutes until the chicken is cooked. Serve with the rice or potatoes.